Cryptocurrencies are all the rage right now, but the SEC’s new charge to crackdown on ICOs has left the infamous John McAfee running for the hills. McAfee, who hasn’t been associated with his eponymous company since 1994, has garnered something of a reputation as a shill for cryptocurrency ICOs — but it seems the scam has come to an end, at least for him. 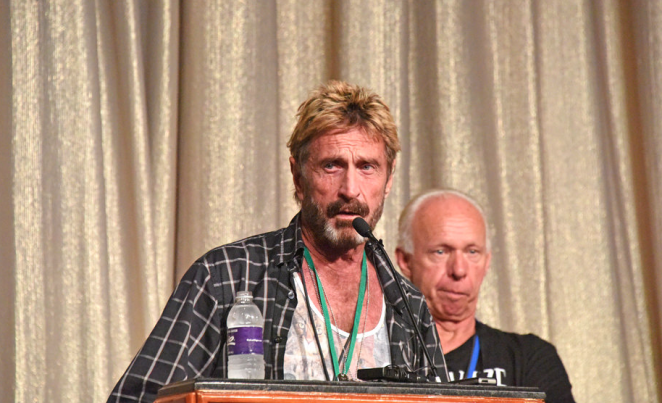 On his verified Twitter account, McAfee declared that he would be removing himself from the crypto game due to “threats” from the SEC. “Due to SEC threats, I am no longer working with ICOs nor am I recommending them, and those doing ICOs can all look forward to arrest. It is unjust but it is reality. I am writing an article on an equivalent alternative to ICOs which the SEC cannot touch. Please have Patience,” the tweet read. The federal agency recently declared that ICOs (initial coin offerings) are “securities” that must be registered and follow the corresponding laws. Additionally, the SEC has cautioned celebrities about the consequences of endorsing and advertising fraudulent currencies. Celebs like McAfee have also been warned about breaking other securities regulations — like failing to meet basic disclosure standards regarding paid endorsements. McAfee’s ICO advisory service reports that he charged $500,000 per tweet and another $100,000 per reply. Conversely, McAfee’s website reportedly states that he earns just $105,000 per tweet. But the SEC isn’t as worried about the profits McAfee and his clients are making as they are about fraud. For example, it was recently revealed that an ICO promoted by McAfee was guilty of plagiarizing its entire website and its whitepaper from a competitor. McAfee is using his power and influence on social media to create profits for himself and his crypto buddies — but what happens to all the people who unwittingly invest in these scams? Bitcoin has been on everyone’s mind as of late. As perhaps the most famous of cryptocurrencies, Bitcoin has garnered a substantial amount of media attention — especially as its value continues to ebb and flow with greater and greater intensity. Initial coin offerings are simply a funding scheme. Companies looking to raise money will post a white paper on a website, post some pictures of their “C-suite executives,” and set up a Twitter account… that’s basically it. The goal is to raise funds by issuing “tokens.” These tokens typically serve as pre-paid credits that can be used within the ecosystem of the company raising the funds. In other words, you’re not actually getting equity in the company… you’re buying a gift card. By offering only a limited number of these “tokens,” ICO schemes are able to artificially create demand. The illusion of demand then creates value — but that value can disappear at any time. If people don’t want to buy your ICO anymore, there’s not much you can do — it basically becomes worthless. Fraud in the ICO industry is rampant; one company reportedly raised $11 million with an ICO — and then vanished, with their investors’ money of course. And because of the nature of ICOs and cryptocurrencies, there is little recourse for duped lenders. Studies have consistently shown that half of all ICO ventures will fail; in early 2018, it was revealed that 46 percent of the ICO operations launched during 2017 had failed by February 2018 — not exactly a good look. The report from February also found that hundreds of cryptocurrencies suffered a partial failure, either because the founders had disappeared from public commentary or there was simply zero chance of success. Learn more about cryptocurrencies at BitcoinCrash.news.